Yesterday was yesterday, with me finding small things to shake me out of the cabin fever rattling around in my own skull (skull fever?). Today was a different day. The fog burned off, revealing brightness and a big landscape to explore. Jon and I were confined mostly to the truck, as our assignment was to patrol the Sno-Parks on the east side of the ranger district. We noticed the blue flash of a Steller’s jay, and that got us talking about the movie “The Big Year”. It’s about three guys who try to see as many bird species as possible in one year, and how they compete and discover friendship. Highly recommended, even without car chases, explosions or lots of special effects. Anyway, it didn’t take long for us to have the idea of keeping track of the all birds we observed in one day. Paying attention really enlivened our travels. We stopped to eat lunch at Reecer Creek, where the forest meets the shrub-steppe. It’s a dry country of grassy slopes and sagebrush, and the ponderosa pines grow in open stands higher up. 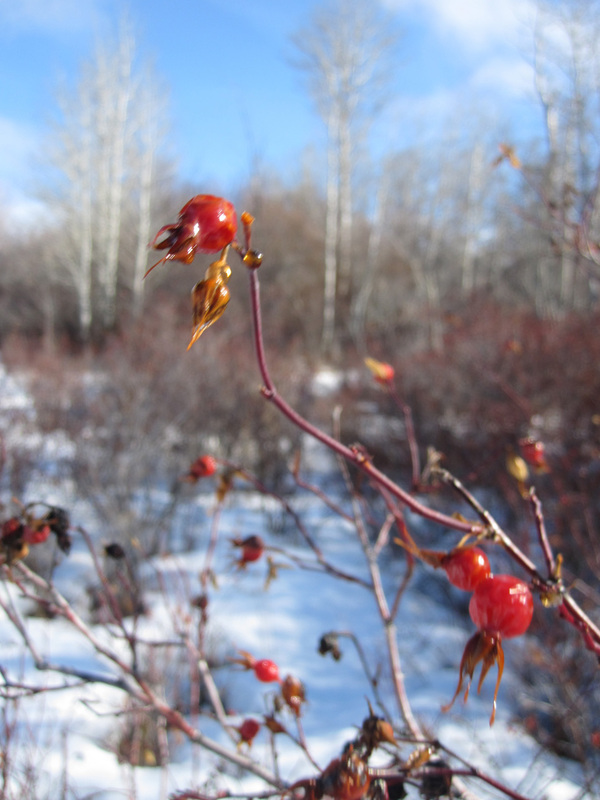 There are dark basalt cliffs, and every draw and creek bottom is filled with dense brush—hawthorn, willow, aspen, wild rose. Shadows were blue on the blazing white snow. We had the windows rolled down and were listening to the radio while we ate. Suddenly the sound went off. We had a dead battery. What’s winter without one dead battery incident? While Jon called for assistance, I got the jumper cables out of the back and we settled to wait. Looking out across the field, I saw a small dark shape moving. It was a hump with a pointy nose that scurried on short legs. A vole. As I watched, a bird flew in and dropped on the rodent and flared up in a flurry of wings. Then it hovered. My jaw dropped, and I looked toward Jon. He was still on the phone. The bird was gray and about the size of a robin, with a white-edged black tail. A shrike. I watched as it struck again and again, each time hovering between attacks. Voles are ferocious, and this one reared up on its hind legs to fight back. After several unsuccessful attempts on the rodent, the shrike flew off. I told Jon what I had just witnessed. He’d missed the whole drama. I got out and walked over to where I’d seen the vole. I found no marks in the snow to show that anything had happened, but I did see the bird perched on a scrawny serviceberry bush nearby. It was a gray silhouette, looking nonchalant but also extremely alert. A pickup towing a snowmobile trailer came up the road and the driver offered us a jump. In no time we had our truck started, and were grateful for the kindness of strangers. Here are the birds we saw today: Common raven; Steller’s jay; Bald eagle; California quail; Dark-eyed junco; Black-capped chickadee; Starling; Mourning dove; Black-billed magpie; Red-shafted flicker; Redtailed hawk; American kestrel; American robin; Brewer’s blackbird; Redwing blackbird; Horned lark; Shrike (couldn’t tell if it was loggerhead or northern); Wild turkey. Of course there were others that flitted across our field of vision that we couldn’t identify because we both staunchly maintain that we are not birders. No way. 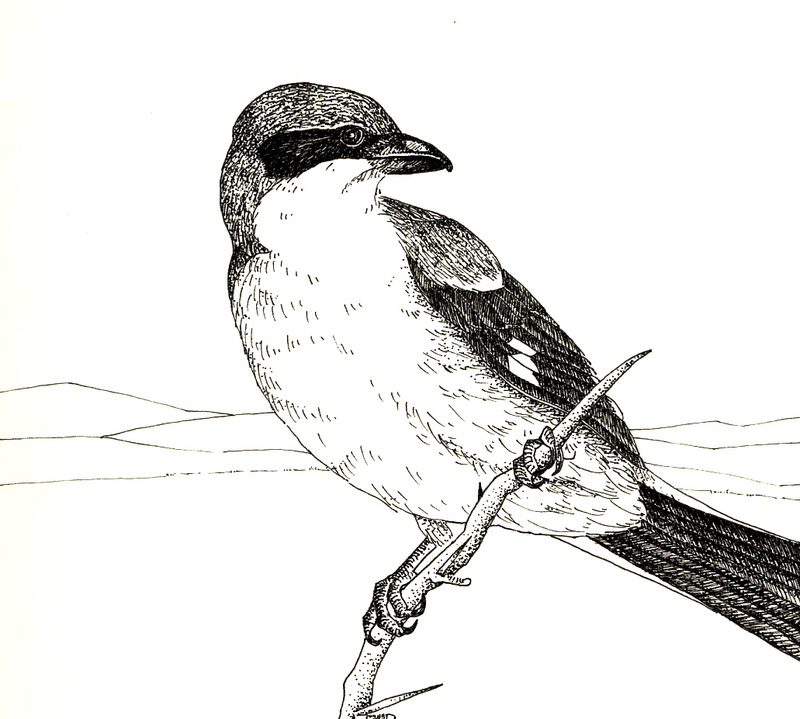 I drew a loggerhead shrike for The Birds of Yakima County in 1996. I couldn’t remember ever having seen one, so my work was done from researching illustrations and the descriptions of Andy Stepniewski, the author. As I sat upstairs in my studio drawing on a winter day, a ruckus erupted at the bird feeder. I looked out the window and there was a shrike—the very bird I was drawing—perched in the bushes with a dead house finch in its claws. Sometimes life brings us exactly what we need. The image of a bird hovering in the sunlight sweeps the cabin fever right out of my skull. Thanks, Deb, for such a sun shiney post… it’s not even daylight here yet and not much above a shivery zero, so, over coffee, I thoroughly enjoyed indulging in all the sunshine, colors, fluttering wings, lilting calls & stuff.